According to ayurveda, horse gram is warm and pungent flavor. It is easy to digest, increases bile and blood. It is very good for health. Horse gram seeds contain protein, vitamin, calcium and iron. Menstrual Disturbance: It is very beneficial for women who have irregular bleeding during menstrual periods. The iron increases hemoglobin in the body. Diabetes: The regular intake controls the glucose level in your body. Stomach Problems: Its habitual use decreases the infection from insects and stomach problem such as acidity. Increase Sperm Counts: Horse gram contains calcium, phosphorus, iron and amino acid which increases sperm count. Horse gram sucked out of the dirt from the body. Reduce Obesity: It decreases body fat and removes the cough from the body. It is rich in protein and fiber which is very helpful to reduce the weight. Fever and Cold-Cough: Horse gram gives relief in asthma, fever, cold-cough and joint pain. 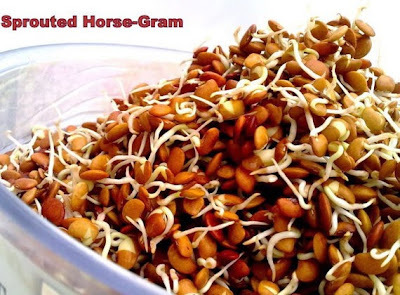 Boil horse gram in little water and use it. It is very helpful to control fever. Constipation: It contains lots of fiber which gives relief constipation. Stomach easily becomes clear by consumption of it. Kidney Stone: Stone will break and it becomes small by horse gram. It easily removes from the bladder and comes out of the urinary tract. How to use: Keep horse gram in the water overnight. Wash it with clean water in the morning and cook it in the morning. You can prepare vegetable or soup. If you eat it in sprouts from then you will get more nutrition. Who should not eat: Pregnant women who want to gain weight or TB patient.